This Fall semester, 4 seniors, Emily Benoit, Keeley Dower, Taylor Finley, and Ingrid Ramos decided to create a CD for The Spot as their Entertainment Practicum final project. The CD is a compilation of 8 live performances from shows at The Spot between 2014 and 2017. All tracks were mixed and mastered by an audio work study. Along with the CD, the students decided to release t-shirts and baseball hats sporting the same designs, which were thoughtfully creating by a fashion design student. Now, as everything has fallen into place, they have launched their sale! 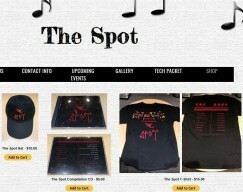 Individuals can buy the products through the students or by visiting The Spot's website.